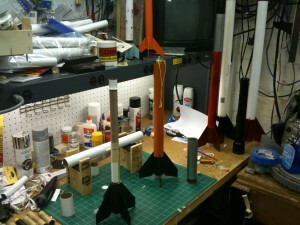 CPG Aeronautics.... » It’s a regular ‘ol Artemis rocket factory! — More first fight test results. It’s a regular ‘ol Artemis rocket factory! — More first fight test results. Production on multiple Artemis mid-power boosters has begun! The second Artemis booster (orange) is in its final phases of completion while a third one is under construction. There will be a total of four boosters built, three of which will be in regular service while the first one, which made its first flights on March 27th, will see limited use, and will be used primarily to test payload sections to be used later this summer. Flight tests for the second Artemis booster are scheduled for April 24 2010, weather permitting. Results from the first flight tests of the Artemis booster shows the booster coming through mostly fine, though a closer inspection revealed some buckling if the “stuffer tube” which holds the first half of the ejection baffle. This could have occurred during the first launch where part of the experimental motor mount system failed – though it did not pose any problem to the flight other than the motor being ejected shortly after parachute deployment. Changes were made to the design of the newer Artemis boosters under construction to correct for this issue.